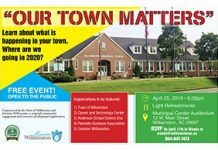 The Williamston community was presented a preliminary strategic plan last Thursday which includes recommendations for implementing the community plan the town has been working on since May. Project Manager Tee Coker, of Arnett Muldrow & Associates in Greenville, presented a strategy board with recommended short and long term steps and goals. The plan is part of a revitaliztion and economic development comprehensive master plan the town is formulating through the Envision Williamston program. The presentation covered four strategies: Economic Development; Design and Planning; Branding and Marketing; and Organization and Implementation. The Envision Williamston Board is expected to recommend the final plan for town approval in December or January. The first recommendation is to develop a retail retention and recruitment strategy, “to keep current businesses and take care of the business community we have, while at the same time expand,” Coker said. To encourage new businsesses, he recommended a Main Street Business Challenge in which prospective businesses enter a contest to win business space in downtown and help with marketing. Coker said the plan is also based on what he called a “Walmart Capitalization Strategy” which assumes the rumored retail development does happen in Williamston within the next year or so. He said local businesses can thrive by offering personal service and providing items that Walmart doesn’t carry. “There is a lot Walmart isn’t going to touch,” he said. Assuming Walmart does locate on property located at Roberts Blvd. and Hwy. 20, the expected development will create a retail draw to the area. The plan encourages franchise type businesses on each end of town, with a more “homegrown” retail and restaurant mix in the downtown area. The plan creates a traditional downtown area with shopping, dining, library, recreation, residential, arts and culture and trails, with access to nearby school campuses. At the center of the downtown area is Mineral Spring Park. Coker said their research shows that Williamston can sustain two downtown restaurants. Recruiting additional retail and developing the downtown area will be the next step. Coker said their research showed 12 retail categories that could be possible business opportunities for the area , with an emphasis on recruiting homegrown local businesses. A key to the plan is having a Downtown Farmers Market with a permanent location. Coker said grassroots, small scale economic development is happening all over the country. He mentioned a short term plan for Town Square Center that incorporates some infrastructure but could increase retail values. Coker said the downtown revitalization would benefit from a “Destination Business.” The planning team incorporated this in earlier presentation with an example of a brewery/restaurant with an adjacent beer garden, for the old hotel property at the corner of Minor Street and West Main. “You need some sort of draw. You are a bedroom community, but it doesn’t always have to be. People outside can come. There is a market there,” he said. To create that the plan makes several recommendations for development driven community infrastructure improvements. Realigning Courtney Street to create a four way signalized intersection was one of the main recommendations. Coker said that the perception of the town needs to be addressed beginning in 2016 with landscaping, zoning and signage ordinances. The plan recommends looking into a Component facade grant with public and private funds to be used for awnings, windows, and other facade improvements. Steps in the recommendation for 2017-18 include expanding the trail network and the overall vision for expanded greenway and park in the center of the downtown area and to neighborhoods. The trail connection extends from the artory to the park and downtown, ballfields, out Minor and to the schools. “This can be done incrementally,” he said. “The civic facilities start to create this cool place,” Coker said. The plan also makes recommendations for the old Winn Dixie and Town Square Center area that would help create a downtown. 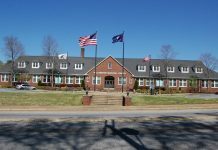 It recommends extending Pelzer Avenue to the back of Town Hall, and create a boulevard from Main Street to the old Winn Dixie. “This creates two sites for potential commercial property and begins the “cultivation of a true downtown feel,” Coker said. The plan also recommends working toward a revitalized Brookdale Park area and Caroline Center. The goal is to build community pride and becoming a destination choice. Use of banners is a quick and easy way to begin to promote the downtown. “Banners provide that visual connection and are quick and easy,” he said. “You need to be thinking of what the Williamston story is going to be and how to get that story out. The plan recommends using public art to cultivate a sense of place. “Use public art as a place to start to circulate,” he said. Longterm into 2019 the town may be ready to draw visitors from I-85 via a billboard. Businesses may want to extend hours, especially during the holidays. Adopting the Community Plan and working with potential partners “to accomplish what we want to accomplish as a commuunity”will be the first steps for 2016. The plan recommends working with neighbors in West Pelzer and Pelzer and possibly having two Volunteer days in the area, one in spring and one in fall. It also suggests rebranding the Greater Williamston Business Association (GWBA) as the Palmetto Business Association to encourage surrounding area businesses to be a part of it. There is also a recommendation to continue to partner with Anderson School District One and the Career and Technology Center on projects. It also recommends exploring a development corporation model. Coker said the final report will have approximately 200 pages and the planning team will present some of the key recommendations and go more in depth on first steps, before presenting it for town approval sometime after Christmas.